Was it the right decision to drop Mohammad Amir from the 15-man World Cup squad? 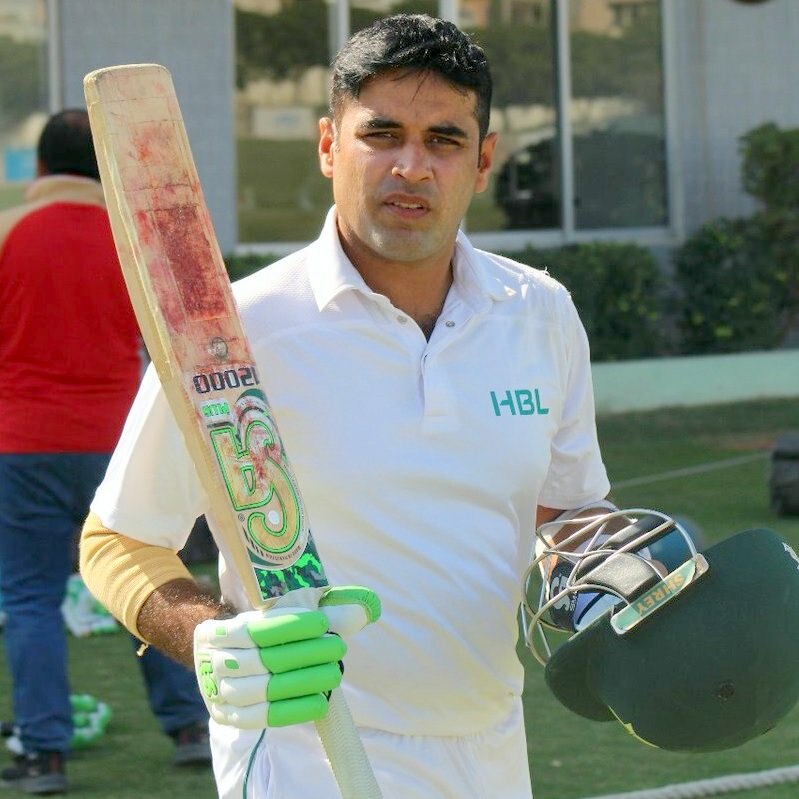 31-year-old opening batsman Abid Ali has impressed all with his recent successes in the Quaid-e-Azam Trophy where he played a pivotal role in his side Habib Bank Limited's title-winning campaign. His performances during recent stints with Pakistan A against Australians, New Zealand A and England Lions have been greatly appreciated and he narrowly missed out on selection for the Pakistan Test squad for the tour of South Africa. In an exclusive interview with PakPassion.net, Abid spoke about the reasons for his excellent performances in domestic cricket this season, the benefits of playing for the Pakistan A side against some top-quality international bowlers, the reasons for a lack of quality Test batsmen from Pakistan, missing out on selection for the Pakistan Test squad against South Africa and his aspirations to play for the national side in the future. PakPassion.net: How do you feel about missing out on selection for the Test squad for the tour of South Africa? Abid Ali: Well, there is nothing much to say apart from accepting what is the reality. Yes, I am obviously disappointed but then this is all part and parcel of being a cricketer. I will move on from this and continue to work as hard as always and let’s see what the future brings for me. PakPassion.net: Tell us a little about the innings of 134 you scored against SNGPL in the final of the recently concluded Quaid-e-Azam Trophy? Abid Ali: I am absolutely indebted to the Almighty for allowing me to play an innings which was crucial for my side HBL during the final of the Quaid-e-Azam Trophy. SNGPL had put up a good first innings total on a good batting track, and so the challenge to play a long innings was there and I took that on by playing very focused cricket to get to my century. I am glad that my innings helped in ensuring that we remained competitive in that game and were able to win the trophy. PakPassion.net: Apart from the century in the final, your first-class season has been a good one hasn't it? Abid Ali: It's been an incredible season for me with my first-class side HBL. I scored 472 runs in 5 matches during the Quaid-e-Azam Trophy this season, and based upon good performances in that competition, I was selected for the Pakistan A side which played against Australians, New Zealand A and England Lions. I believe that my success was due to some excellent preparation I did before the start of the season where I attended a camp at the NCA. I was really supported by Mushtaq Ahmed and Mansoor Rana who helped me improve my overall game, and Mudassar Nazar spent a lot of time with me on improving my batting skills which proved very useful. All this preparation gave me a good basis for the season and I scored my first hundred of the season early on which gave me great confidence as well. PakPassion.net: You seem equally adept in the four-day game and the 50-over format as well. Abid Ali: My performances speak for themselves as I scored two hundreds in the Quaid-e-Azam Trophy and also have a double-hundred against Peshawar for Islamabad during the National One-Day Cup at the start of the year. The 209 not-out I scored in this game was also the then highest List A score by a Pakistani batsman which does show that I am comfortable in the long and shorter formats of the game. Ultimately, more than talking about it, it’s down to a batsman’s performances which set him apart from others and hopefully I will keep on performing in this way in the future too. PakPassion.net: How beneficial was your recent stint with Pakistan A in the UAE? Abid Ali: I really enjoyed my time with Pakistan A where I got to play against some excellent opposition in the UAE. To start with, the match against Australians was a good one as I gained a lot of confidence by playing innings of 85 and 52 against a bowling attack which had some top quality international front-line Australian bowlers like Mitchell Starc and Nathan Lyon. I carried the confidence I had gained from this match into the series against New Zealand A and was I able to replicate my good performances in that series too as I scored 83, 61 and then 104*. I then followed up my successes against New Zealand A with more good innings against England Lions. The 113 that I scored in the four-day game against a bowling attack which had the very fast Mark Wood in it was a memorable knock for me as we had to chase a very tough target of 312 runs and my innings was crucial in helping us win this game. In the five-match One-Day series after the one-off four-day game, I scored 140 which really gave me a great morale boost as well. I suppose, I utilised all my skills and experience from before to deliver the best I could for my team and of course, also learnt a lot from playing against some quality opposition bowlers during my stint with Pakistan A.
PakPassion.net: Is there a shortage of good quality batsmen in Pakistan who can do well in the longer formats of the game? Abid Ali: It's not for me to say or comment about others but my view is that there is a lot of focus on the faster-paced style of cricket such as the very popular Twenty20 format. We now have the T10 version as well and so it seems that less people are interested in Test cricket and the emphasis on the longer format of the game has reduced from before. I feel that there should be more focus in domestic cricket on the four-day versions of the game. Whilst the PCB has paid much more attention to the longer format, it is also true that tournaments such as the Pakistan Super League are grabbing more coverage and it has got to the point that someone performing well in the PSL has a very good chance of making an entry into the Pakistan side. We have some very good performers in domestic cricket who are doing well in first-class cricket and more weight needs to be given to their performances when selecting the Test side. PakPassion.net: Who are your role models in terms of batting? Abid Ali: I have never followed any player in particular as I have great belief in my own abilities and I'm always looking to improve my skills. In terms of players I admire greatly, it has to be the legendary Indian batsman Sachin Tendulkar and I do study his shot selection and balance at the crease. Then there is Ricky Ponting who I also admire and of course when it comes to Pakistan batsman, there is no better example than Inzamam-ul-Haq. I suppose, without blindly following any batsmen, my intention is to adapt all the good aspects of top players. I would like to also mention Kane Williamson here as we all saw his batting in the recent Test series against Pakistan. In fact, you may have seen my picture with Kane Williamson in my social media profile and that is because I was really impressed by him not only due to his obvious batting skills but also the fact that he plays with a cool head and that is so important for any batsman. This is also a quality that I wish to have in my batting. PakPassion.net: Your thoughts on the current standard of domestic cricket in Pakistan? Abid Ali: I have seen a lot of improvement in the standard of domestic cricket in the past few years and with the new Chairman in place, we are hearing of more changes to the system which is good news for Pakistan cricket. So, day by day, things are improving but we also have to realise that there has been an increase in the number of events in the calendar and the PCB has to make sure that each event is given its own importance. This is a difficult task for the PCB in terms of scheduling and other arrangements, but they will need to work harder to ensure that standards are maintained. In terms of improvements, I would like to see more first-class games being televised and special attention paid to the quality of umpiring in these matches which I have to say has improved a lot over the years. Similarly, the quality of grounds and facilities are all areas which need attention from the PCB as well. As far as the type of balls used in domestic cricket are concerned, I have been comfortable with the Dukes ball for a few seasons now and to be honest, we as cricketers will play with any ball that is acceptable to the PCB and it's our job to focus, adjust and play our best with whichever ball that is used. PakPassion.net: There seems to be a shortage of quality openers in domestic cricket, but you have done really well. What is the reason for your success? Abid Ali: There is no magic or secret to my success in domestic cricket. To, me it’s simply down to the preparation I do on the day I have to bat. And while I am batting, I am totally focused on the task at hand and think carefully about what shots I wish to play. But most importantly, I bat according to the requirements of the team and as per the match situation and then trust my skills and judgement to do the best for my side. PakPassion.net: Who are the toughest bowlers you have faced in domestic cricket so far? Abid Ali: To be honest, all of Pakistan’s domestic bowlers I have faced have been tough to counter and it's difficult to single out any one bowler like that. In my view, each of the bowlers whom I have played against such as Mohammad Amir, Wahab Riaz, Usman Shinwari are all very skilful and ask a different and tough question from each batsman, but I have found Mohammad Abbas particularly difficult to face. Also remember that when you play a long innings, then you are also likely to be tested by spinners so even in the area of spin bowling, we do come across some tough competitors and Pakistan is also blessed in this aspect of our cricket as well. PakPassion.net: What are your plans for the future. Are you optimistic about a place in the national side? Abid Ali: The aim is to continue what I am doing now which is to work hard and also score more runs. I have been told to work on my fitness which is something I will be paying a lot of attention to and will be training in the NCA to ensure that I am ready whenever the chance comes to play for Pakistan in future.